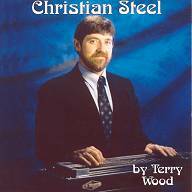 Outside of his home state of Missouri, Terry Wood is probably best known for his pedal steel and dobro instructional courses (published by Keith Hilton Publishing). He plays a 14 string BMI custom built by Zane Beck, tuned to Julian Tharpe's extended E6th copedent. 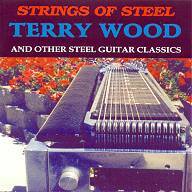 For this extra-length CD project, Terry pulled together the best songs from several of his instrumental cassettes. Even though the recordings span several years, Terry's consistent style and the tone of his custom-made 14-string BMI tie the album together seamlessly. Terry's country gospel CD, recorded in 1995, has "universal" appeal. Once again Terry shows off the versatility of his 14 string technique. 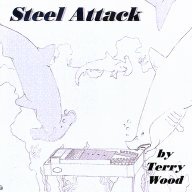 Terry's copedent is very similar to that of pedal steel innovator Julian Tharpe. This CD was recorded in 2006. The format is trio - steel, bass and drums - resulting in a refreshing minimalism that features the Terry's pedal steel front and center.